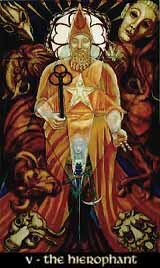 The Hierophant is a symbol for a world of belief and confession, may it be a church, a sect or an occult society. He's the pope, the druid or the High Priest in a system of creeds and dogmas. He represents the religious and intellectual tradition of a person, and may be the one the person is born to it or possibly the one who has chosen it by himself. In the positive aspect, the Hierophant represents the search for knowledge and illumination, the desire to study creed and dogma instead of simply accepting them, to research and achieve further development. It also stands for the deep fulfillment someone can find when really trusting their own beliefs. In a negative view, the Hierophant can stand for bigotry, the blind faith in dogma, intolerance towards everything different from the own confession. It can also mean gullibility, running to any kind of new belief just because the traditional one is suddenly considered boring or unsatisfying.